The author has sold more than 85 million books which discuss the issues parents and children face daily. This particular volume is certainly one of the best and most important, in my opinion. The author takes a non biased analytical approach to present information in a nonjudgmental way allowing the reader to make an informed decision. First, Berry points out the items you need to know. There are prescription and non-prescription drugs. She discusses the reasons one is tempted and the reasons one should not use them. The author explains how to avoid abusing them and how to say no to drugs if you don’t want them. She emphasizes the fact that our environment contains both good and bad things. When you use them in a positive way, you make your life better. Drugs are neither good nor bad in themselves. If you decide to abuse drugs, your body becomes dependent on them, and you become physically and psychologically addicted. Berry then discusses almost every type of substance abuse including alcohol, marijuana, cocaine, hallucinogens, sedatives, tranquilizers, opiates, and even glues, liquids, and chemicals. Then Berry lists the long and short term effects of each. She discusses the reasons people decide to abuse these drugs, the reasons for avoiding them and how to avoid getting into these situations. She suggests that teens shun situations that don’t represent their life style and things like clothing, movies and posters that feature such abuse. Berry details the exact way to handle these situations with actual suggestions on what to say and do. Her bottom line is that you can always ask for the support of parents or friends. No one plans to become an addict. At the same time, no one can force you to to drugs. It is YOUR DECISION. 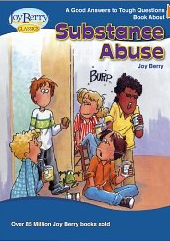 Parents and teachers who are looking for a starting point of discussion on substance abuse will find this book invaluable. Berry presents the information in clear, concise form. She is completely non-judgmental and does not come across as an authoritarian figure. Adults can use this book as the basis of discussion with the child to learn and understand what she needs and wants to know, and how she feels about friends and peer pressure issues. Children as young as eight or nine can certainly benefit by having this discussion sooner rather than later. If you enjoyed this post, please consider following this blog by clicking on word Follow at the lower right or hitting the RSS orange button at the top of the page.